The ministerial committee formed to deal with the phenomenon of illegal infiltrators living in Israel convened for the first time Thursday. 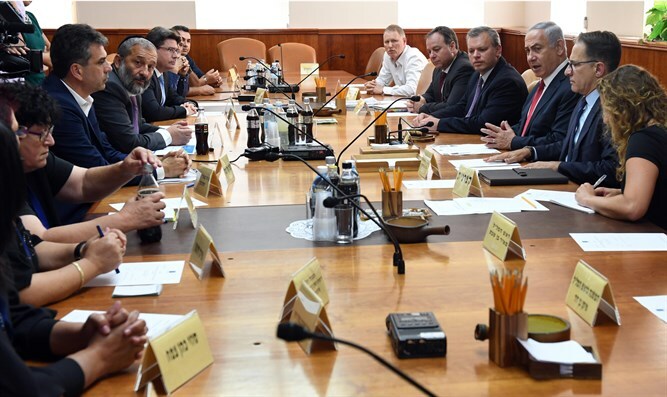 The meeting was attended by Interior Minister Aryeh Deri, Justice Minister Ayelet Shaked, Science and Technology Minister Ophir Akunis, Economy Minister Eli Cohen, Deputy Finance Minister Yitzhak Cohen, and Prime Minister Binyamin Netanyahu, who chairs the committee. The meeting was also attended by residents of the southern Tel Aviv neighborhoods who spoke about their daily hardships. The residents expressed their frustration with the fact that many organizations in Tel Aviv are working to help the infiltrators. They said that the law enforcement activity in southern Tel Aviv in insufficient, even against businesses which employ illegal infiltrators. Prime Minister Netanyahu said: "We are here to meet every few weeks to try to alleviate the distress of residents of southern Tel Aviv, as well as other places in Israel, due to the problem of illegal infiltrators." "Our first and primary goal is to remove as many of them as possible from within the borders of the State of Israel. They do not have a right to be here, they do not have to be here, and with our combined efforts here, a potion of them will not be. This rest will also be discussed, but this is the main task, and I am happy to see you here," the Prime Minister said. Netanyahu spoke of his two visits with the residents of southern Tel Aiv. "First of all, I was impressed by the spirit of the people who still cling on instead of [giving into] despair. But I also felt that there are things that we can do, and that is the purpose of this meeting." "Following the tour during the day, I went on a secret tour at night, together Interior Minister Aryeh Deri. We went through all the streets and neighborhoods, and I was able to get an impression of what the situation is at night," Netanyahu said. The Prime Minister emphasized that the solution the committee must focus on is the removal of the infiltrators. "We will not be able to get everyone out, but we have already removed close to 20,000. And we will have to complete this work with at least a similar number, and perhaps even beyond."